At first, it may be hard to understand why a relatively young player would walk away from the NFL. You work your entire life to get there, beating nearly impossible odds (0.2 percent of all high school seniors who play football make it to the league, according to the NFL Players' Association). The riches and spoils should be enough to keep you happy (pro football ranks fourth in pay among the four major sports, but players still average north of $1 million a year). All very compelling reasons to stay. But what if you're just old school? What if you can't stand the flashy touchdown dances and the nonstop promotion of stars over teams? Would that be enough to force your hand? 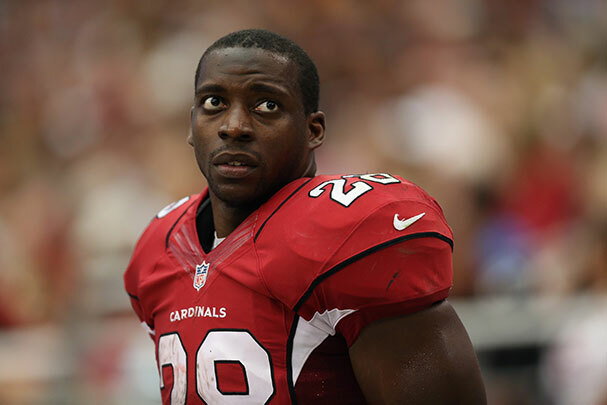 In a piece posted on the Huffington Post last night, Arizona Cardinals running back Rashard Mendenhall announced he was leaving the sport at only 26 not due to injury, not because he's unwanted by a franchise -- although he lost his starting gig to a rookie last season -- but because he feels like an outsider watching the "business of entertainment" in football. The RB writes about the shift in the professional game from a team sport that valued hardwork and commitment to a non-stop entertainment mega-package that promotes showmanship and individual stats. I am not an entertainer. I never have been. Playing that role was never easy for me. The box deemed for professional athletes is a very small box. My wings spread a lot further than the acceptable athletic stereotypes and conformity was never a strong point of mine. My focus has always been on becoming a better me, not a second-rate somebody else. So if not a pro, what's his plan to become a "better me"? Well, Mendenhall just wants to "travel the world and write," so maybe the HuffPo thing was a good start. And hey, the dude earned $15.1 million over six seasons, not a bad nest egg to kickstart those travels. And for anyone questioning his commitment, he makes sure to note that his love of the game should not be doubted, even if he devotes time to dance, art, and literature. That's probably where the whole "my wings spread a lot further than the acceptable athletic stereotypes" part comes from. But if anything, Mendenhall's piece reads less like an indictment of the NFL and more like an affirmation of life. "I plan to live in a way that I never have before, and that is freely, able to fully be me, without the expectation of representing any league, club, shield or city," he writes, adding, "I do have a plan going forward, but I will admit that I do not know how things will totally shape out. That is the beauty of it!" Hey, the choice is his to make. If he no longer wishes to "put my body at risk for the sake of entertainment," those are his millions he's leaving on the table. What do you think: Has the business of the NFL lost its way? Enough to the point that, like Mendenhall, you would walk away?